I think it is so important when you have a chronic illness or disorder, whether Celiac or Diabetes or Fibromyalsia or whatever, that you treat not just the illness but all of you. This means focusing on all aspects of you, not just the "sick" part. It can become very easy to start living the diet instead of making it part of your life. You need to remember to take care of, not only your illness, but all of the other parts of your life: friends, family, hobbies, guilty pleasures. Yes, treat yourself to the new specialty food or cooking appliance, but also make sure to pamper yourself in other ways. Buy a new hat. Get a massage (I did this yesterday!) Listen to some fabulous music. Learn to crochet. Dance in your family room. 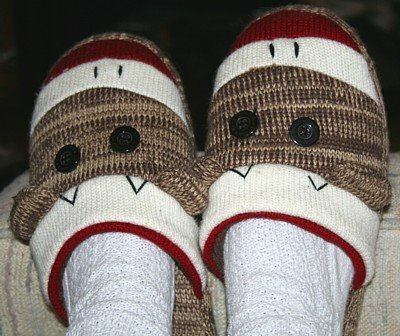 Buy new slippers. Anything that makes you smile and gives your heart and soul a little lift. A fabulous local girl, Jenni, is a champion at this. She believes in it so strongly that she has an entire web site for girls like us called Chronic Babe. Go check it out, even if you are dude instead of a babe. Let others know about it. Spread the word. Our chronic disorders (I hate the word disease!) are an important force in our lives, but it need not completely define who we are. Celebrate all of the other amazing things in your life that make you the unique person that you are! So what do you do to pamper yourself? Since I can no longer just run to the local grocery store to pick up a loaf of bread, I plan on investing in (or begging my parents for) a bread machine. There are so many out there and they range in price from so-cheap-I-am-suspicious to oh-holy-god-the-pain-expensive. What do you use? What has been the most successful for making gluten free bread? Any hints and tips on purchasing one? How about the ins and outs of using them? I am basically a novice at making bread. (I have only done it a few times.) Any help is most appreciated! In more spectacular news: A fellow teacher just told me about a local pizza place. The owners' son has Celiac. Consequently...GF pizza! I am very excited about this. I LOVE pizza. I thought I would have to make it myself for the rest of my life (which means I would rarely ever eat it.) I tried the Amy's Rice Crust pizza and wasn't happy. Perhaps I am picky or just spoiled from years of Chicago pizza. Now, I may be able to have it again! After that I headed to Trader Joe's to do some shopping. Trader Joe's is heaven. They have so much food I can eat. Good food. Some of it is convenience foods, which is a good thing. I love to cook, but some days I just don't have the energy to make a big meal. The great thing is that they have a very comprehensive Gluten Free Shopping List available at their customer service desk. Even better...they are way cheaper than Whole Foods. I am being proactive, my lovelies. I am doing research. Food research, that is. A few days ago I called Borden Dairy and discovered to my delight that their cheese singles (the incredibly gross Kraft Singles-like cheese that I can't help but love) are gluten free. Why do I like this overly processed "cheese"? Don't know. I think it is a nostalgia thing. Yesterday I received a reply to an email I sent to Trader Joe's regarding a GF shopping list. They pointed me to a link on their web site I did not see. Also, each store is supposed to have more extensive lists at their locations. Excellent! Today I emailed Ghiradelli and Starbucks (come on, chocolate and coffee!) to see what I can eat/drink of their products. I know lattes and cappuccinos are safe, but I like all the sweet flavorings. What I really need to know is if I can drink the Chai and hot cocoa. I have a raging sweet tooth. It is bad. Currently, I am looking through the GF foodlist (see my links). I printed the whole thing up and have it in a binder along with the GF shopping list from Whole Foods. I am making a list for my shopping expedition today. I plan on hitting Trader Joes. I also need to pick up some plastic storage containers for staples like rice, gf pasta, gf flours, rice, sugar, salt, and rice. Oh, did I mention rice? I have realized that I will be needing to purchase it in bulk quantities. Ooooh! Also polenta. Yum! Thank god I can still eat polenta. I used to buy the pre-made, tube-like polenta. It was ok. Good for an on-the-run meal. The thing is, quick cooking polenta really does not take that long to cook. You end up with more. It has a far superior consistency and more options for flavoring/seasoning. Mmmmm...I think I may need to make some this weekend. As I am typing I am cooking up another batch of the breakfast rice concoction. This time I am trying raisins, dates, cinnamon, and brown sugar. I hope it turns out as tasty as the previous batch, because I am down right starving!!! Hmmm...I thought I posted this yesterday. Apparently not. So this all applies to Sunday/Monday. So I am thinking of contacting University of Chicago about finding a dietician. Not sure how much it will help, but it's worth looking into. U of C apparently is one of two Celiac research facilities. They ought to know who to work with in this big city of mine. I'm also hoping to connect with a local support group. While all of you are fantastic, I would love to sit down, face to face, with others who are living gluten free. Get the local scoop on restaurants and such. Yep, gotta look into that. This morning I was STARVING when I woke up. OMG, hungry! I didn't feel like peanut butter today so I topped my rice cake with sliced bananas and a mixture of cream cheese and brown sugar. Wow, so good. Today I have friends coming over for a potluck dinner. 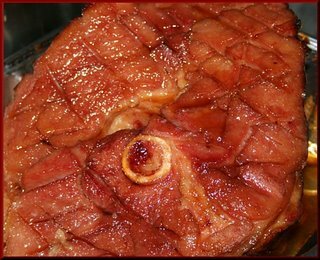 I made a ham. My first ham ever. I basted it with Reed's Ginger Beer and made a glaze of brown suger, ginger puree, and just enough orange juice to make a paste. It smells fabu. It looks very nice. We shall see how it tastes. Here's a preview of le ham. So... I'm ready to feel better. Certain things are improving. I am actually hungry again. For a while there I was not even hungry. My stomach was so bloated that there was no room for food (at least not without having stomach pain after eating.) Now I am hungry. Still bloated. Not as painful, though. I swear I have been eating gluten free, but then my tummy bloats up. I don't think there was cross-contamination. I suppose there could be. It's probably just longer term side effects of all my gluten gluttony. (I gorged myself on all the foods I would have to give up while I was waiting for my test and it's results.) I'm just ready for the bloat to go down and to not have other unpleasant...malodorous symptoms. Enough already! I think my energy levels are up, though. I don't feel as constantly fatigued. I was starting to worry about that. I had started having an itchy rash, as well. I would have it in the morning when I woke up. It was always located on my legs, along the back and sides of my thighs. I had thought it was some sort of contact dermatitis. I realized this morning that it had been a few days since I experienced the awful itching. Since just after switching my diet. I suppose I should be happy with each small improvement. Count each as a step towards healing. I just want to feel better. Completely better. I hope it comes soon. One of the silver linings in all of this Celiac craziness is the fact that I actually love to cook. I love cookbooks. I will spend an afternoon going through them looking for a recipe that sounds appealing for the coming week. Therein follows a day of shopping, cleaning, and cooking. So I've been doing some cooking this past week. My first GF meal was a soup. It was ok. Not bad, but not great. Eh. Thankfully, it went uphill from there. So here are two successes. 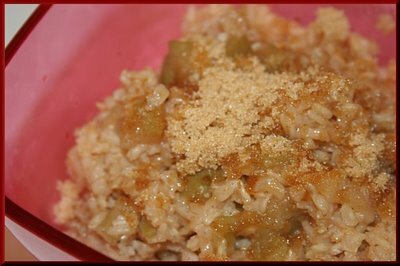 The first is based on a suggestion from http://www.glutenfreegoddess.blogspot.com/ It is a great substitute for oatmeal. In a medium saucepan, bring apple juice and chopped apples to a boil. Add rice, cinnamon, and nutmeg. Reduce to a simmer and cover. Cook until rice is tender. You may need to add extra juice as it cooks. Top with brown sugar. I tried topping it with honey, but it just wasn't as good. I don't know if it was my rice or the fact that it is made with apple juice, but it seemed to take forever to cook. It was worth it, though. I packed up the leftovers in single serving tupperware and brought it along to work for breakfast. It did not suffer in being reheated. An extra bonus: it smells amazing! Gotta love those spices. Tonight I came home and decided I needed to use some ingredients before they went bad. All I can say is...OMG, YUM! Heat a medium nonstick skillet over med-high heat. Add garlic and onion, and saute. Add onion and saute until they begin to soften, 3-4 minutes. Add sausages, saute for another 5 min. then add spinach. Saute until spinach begins to wilt. Add salt to taste. In a large saucepan, bring milk and water to a boil and stir in the pumpkin. Add the polenta and stir until it masses, about two minutes. Remove from heat and add the thyme, salt, pepper, and nutmeg. Adjust the seasonings. Pour or spoon the polenta onto plates and top with sausage mixture. Garnish with parmigiano cheese. This recipe is a modification of one found in Rachael Ray's cookbook 365: No Repeats. Oh man. I have to admit that I love polenta. I could eat it every day. This was a wonderful variation. The pumpkin and milk (original recipe called for chicken broth) helped create a nice creamy texture. The sausages were very tasty. I liked the sweetness from the apple. Unfortunately, I did not have spinach. I had a bag of mixed collard, mustard, and turnip greens. For some reason I thought to saute them up separate from the other food. Thank god! I did not like the greens at all. Too bitter. Very pungent. I will make with spinach next time. No substitutions on that! Since I tweaked this one myself, let me know if you try it. Tell me what you think and any adjustments that you think it may need. Today I experienced one of the big inconveniences of Celiac Disease and living gluten free. I had to stay late at school because we were having a Local School Council (our local board) meeting. I was scheduled to give a brief presentation about our fine arts program. (It all went very well, thanks for asking!) Anyhow, since I had to stay late I needed to grab some food. I did not plan ahead. That was dumb. I ran to the best local grocery store. I knew I would never find food at a fast food joint that I could eat. Even if the item was inherently a gluten free meal, the risk of cross-contamination was just too high. I know myself. I need to start off very strict. If I let little things slide now, it will be a disaster later on down the road. So over the river and through the woods, I ended up at Dominicks. They have an amazing selection of GF foods. I was very impressed considering it is a regular chain grocery store, not a specialty store. That being said, I did not find a quick meal. Oh well. Lesson learned: plan ahead! The trip to the store was not a loss. I found two products that I will definitely be purchasing again. 1) Genisoy makes a snack called Potato Soy Crisps. OMG, yum! I bought the Sea Salt and Black Pepper crisps. So. Tasty. You have to really like black pepper, though. I need to head back and purchase the other flavors (they were on sale). 2) Pamela's Products Ginger Cookies. This was my first foray into gluten free baked goods. I have to say, I was braced for the worst. These were pretty darn good. If I hadn't known they were GF I never would have guessed they weren't just soft cookies. Very gingery. Maybe I lucked out and bought two of the top products on my first outing. If so, yay! If there are other better product...well, hot damn! I can still snack away and assuage my sweet tooth. While I can no longer eat Chips Ahoy! (those cookies so chock full of chips), I can have a post that is chock full of pics. So we shall begin this post the way I began my day, with a breakfast of champions. 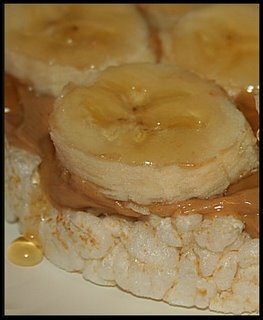 Rice cake, peanut butter, sliced banana, and a drizzle of honey. Yum!! Today was my first real day of gluten free eating. Ironically, I have more tummy pressure (bloaty belly!) today than I have in a while. I know I did not eat any gluten. I even bought a new jar of peanut butter to avoid cross-contamination. Does it get worse before it gets better? Seriously, I look pregnant. Ugh! Oddly, I have felt hungry all day. Over the past couple of months I only feel hungry when I am starving. The stomach discomfort seemed to leach away my appetite. The appetite was back in spades today. Perhaps that's a good sign. Speaking of cross-contamination, I read recently that it would be wise to get ride of all my wood utensils. Apparently gluten could be hiding in the porous material. Considering I don't have a dish washer (besides my hands) I am paranoid about this happening. Now I am worried about all sorts of weird cross-contamination situations. Both of my pets eat food that have gluten in it. If crumbs from their food land on the table or counter it could potentially get on my hands and in my food. Silly? Perhaps. I just want my symptoms to go away. I am getting great support in this whole endeavor. My family has already run out and bought GF flours. My friends keep sending me messages about a product that they saw labeled gluten free. And don't forget my in-house support team. I started my Gluten Free voyage this evening with a trip to the grocery store. I made sure to go in prepared. I made a list. I even went online to to the GF Foodlist (see my links!) to find out which specific brands to purchase. I figured that way I could eliminate some time reading lables. Well, two hours and WAY too much money later, I am home and stocked for the immediate future. I have to say this was an interesting trip to the store. I am used to going in with a list (and usually a few meal ideas), but purchasing whatever peaks my interest. Angel food cake? Sure! French bread and brie? Yum!!! It was definitely a different experience today. Since I planned ahead I think the trip was less frustrating than it could have been. I went in with a specific purpose. I was on a mission. It was fruitful. Literally. I don't think I have bought that much produce in a long time. It was amazing to see the difference in my shopping cart today compared to my last shopping trip. I usually have a large percentage of my items from the frozen food isle. This time...none. Lots of fresh produce, meat, and new ingredients. I bought quinoa for the first time. Not quite sure what I am going to do with it. I am going to look for some recipes and see what I can create. It stared months ago. Stomach problems. I thought it was stress. How could it not be, school was crazy! I tried exercise, I tried massages, I tried to just relax. Some of it seemed to work. Some of it was quite enjoyable (go massage!) The intestinal distress just never went away, though. I made an appointment with a GI. Typical of a specialist, I had to wait a little over two months before my appointment date. When I finally saw him (wow, what a strange little man) he seemed to agree with me on the diagnosis. IBS exacerbated by stress. Ok, that's manageable. Exercise, healthy diet, manage the stress, and a nice little pill to help it all along. No problem. He didn't want to run an invasive tests that were not necessary. I thank him for that. "While we are at it, though, let's run this one blood test. It's a non-invasive test and will rule out a more serious condition. I'm sure you don't have it. It will just be good to be able to definitively say this is not the cause." Why not? One blood test and you know you don't have this other, more serious condition. Sounds good to me. I mean, he did say he was sure I didn't have it. Except...then he called with the results: abnormal. Celiac disease (CD) is a genetic disorder. In people with CD, eating certain types of protein, called gluten, sets off an autoimmune response that causes damage to the small intestine. This, in turn, causes the small intestine to lose its ability to absorb the nutrients found in food, leading to malnutrition and a variety of other complications. The offending protein, gluten, is found in wheat, barley, rye, and to a lesser extent, oats (WBRO). Related proteins are found in triticale, spelt, kamut.